Based on real events that occurred in the year 2016 , this movie shows Pakistani terrorists launching a terror attack on an Indian army camp in Uri in Kashmir . The attack on sleeping Indian soldiers catches the Indian army by surprise , killing many of them . While India pretends to be ruminating over what to do , actually Prime minister Narendra Modi has given the order for retaliation in form of a surgical strike into Pakistan occupied Kashmir . The surgical strike is successful , killing scores of Pakistani terrorists in surprise attack . The movie shows a partly real and partly fictionalised version of the events . 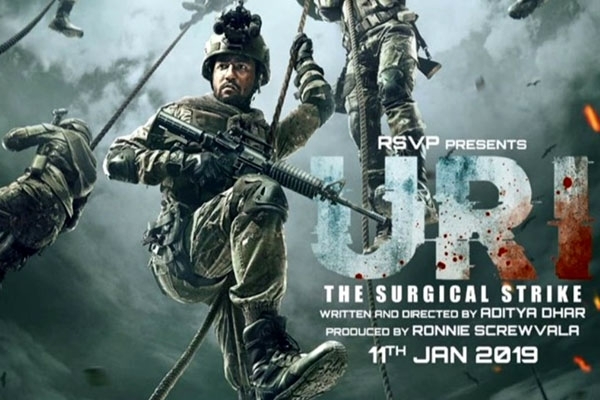 The fiction lies in Bollywood tale of the hero Major Vihan Singh Shergill ( played by Vicky Kaushal ) losing his brother in law Major Karan Kashyap ( played by Mohit Raina ) in the Uri terror attack , and volunteering for the surgical strike to take revenge . He then successfully takes a team of commandos across the line of control to kill Pakistani terrorists in their living quarters in Pakistan occupied Kashmir . As he had promised , he kills the terrorists by entering their very homes . This is of course like a typical Bollywood revenge story . But the major difference from other Bollywood revenge stories is that both the Uri terror attack and the retaliatory surgical strike actually happened . The movie does show the actual manner in which the Uri terrorists must have infiltrated the Indian army camp and killed Indian soldiers . And the retaliatory Indian surgical strike is the main event of the movie , for which I and the audience had come to the theatre . The movie is successful in creating the grief of the families of those who lost their sons in the Uri terror attack . And the desire for revenge . The surgical strike is filmed brilliantly , and unfolds like an action thriller . Except the fact that the emotions are real and you do not feel detached from the events in the movie like you feel for a normal action thriller . This is your country's soldiers taking just revenge for their brothers in arms killed and hence you feel deeply connected with the movie . The fighting has been shown well , with automatic rifles blazing and grenades exploding at regular intervals . The grenades explode creating yellow flames and the bullets hit hard sending the Pakistani terrorists to their deaths . Knives are used to sever body parts , and at times the fighting becomes physical combat . Meanwhile Bofors artillery guns keep the Pakistanis busy on the border by regular shelling . Indian troops are transported to attack by helicopters painted in Pakistani colours . The Pakistani terrorists' living quarters are booby trapped by grenades , and getting past them is a tricky task . But Major Vihan takes his men past the obstacles to annihilate the terrorists and brings Indian soldiers back to Indian territory without losing a single man , just as he had promised . The film has war cries and patriotic chants , and they serve to heighten the drama of the movie . But there is no excessive jingoism . Paresh Raval plays a character like national security adviser Ajit Doval and he is in overall charge of the operation . Rajat Kapoor plays PM Modi . They have some tense moments as they wait in the command centre masterminding the operation . The movie has some women characters like Yami Gautam playing an intelligence agent , and Kirti Kulhari playing the pilot who flies the helicopter that takes the men back to Indian territory . Colours of the movie are decent , and background music and songs are decent too . Acting is good by everyone . Cinematography is good , especially of the surgical strike . The movie will be appreciated by all nationalists and patriots . Copying from Udta Punjab thread. Looks like now BJP has also learnt the importance of films before elections. My elders tell me Punjab always had drugs menace in Universities from the 60s. Being a border state drugs infiltrate from our semi-porous borders.. same for Gujarat and especially Rajasthan. Defaming the whole state for a few votes, a very dangerous trend.. I'll make a movie named Andha Pradesh for AP, Ulta Pradesh before UP elections, Waste Bengal ..
Full page ad by delhi govt for Punjab elections.. This one, plus accidental PM seem to work as publicity. Plan to watch both. Looks like there was ‘Bharat mata ki jai’ And a bit of ‘Modi Zindabad’ in an AMC theatre in Bay Area as per someone in a WhatsApp group who saw this. Just tell me that it is nowhere near like that latest JP Dutta movie... and I will watch it. Don't remember the name of that movie... but it was based on some Indo-Chinese battle and it starred Arjun Rampal and a bunch of other guys. After the nth verbal skirmish with the Chinese army before the hour, I lost all interest in the movie. I mean, I did even try to stretch it to the hour... then realized there will be another hour of the same nonsense Couldn't take it any more. Just tell me that it is nowhere near like that latest JP Dutta movie... and I will watch it. I heard this review from somebody.. it is unlike any Bollywood action flick.. no drama at all, no emotional scenes or personal stories, only action.. that too Hollywood style. There were a bunch of Jai Hind chants too throughout. did the movie have that 72 hoors dialogue or was it censored? I saw it here in Los Angeles . The dialogue was there . Very slick movie. A Must watch. Or fine to watch on home HDTV? Or must watch in hall with chants of Jai Hind.. for the atmosphere? I don't go to movie hall unless it's a must watch in hall.. kyunki saala do mahine pe Netflix pe aa hi jayegi.